ARE YOU (OR SOMEONE YOU KNOW) HEADING TO MELBOURNE? YOU NEED TO CHECK THIS OUT. The NGV or National Gallery of Victoria. Melbourne, Australia. Very rarely do I land in a place and rush to a museum or gallery. Rightly or wrongly I decided very early on in my travelling career that I would leave the heavy stuff (for example the National Portrait Gallery in London, the Louvre in Paris - although I did make a quick visit once to see Mona Lisa, so incredibly small? ), until dancing in clubs and walking up tall things was difficult. And so, as I am still dancing, many of the world's great museums and exhibits are yet to host me. 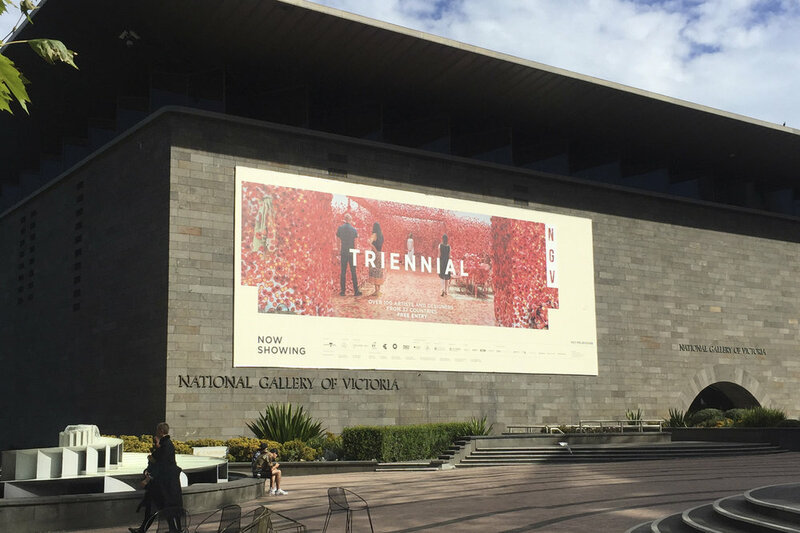 However, recently whilst booking a trip to Melbourne I knew that during my time there I was going to have to visit the National Gallery of Victoria (NGV) and the exhibition ‘Triennial’. Why did I know I needed to visit this exhibition? Had I found myself involved in a discussion about the arts with a friend and he’d insisted I must go? No. Was I browsing the internet looking for an event of some kind to attend so as to scratch a cultural itch? I think given my opening paragraph you know that ain’t it. Was I encouraged to go by some arts programme broadcast on RNZ National? Or perhaps a podcast? No and no. No, I knew I wanted to go to the NGV for the ‘Triennial’, because I’d seen a million pictures of it posted on Instagram. Eh, life in 2018! “It’s art for everyone”, someone described the exhibition to me as. And whoever that person was, they were right. If like me, you aren’t an art connoisseur, struggle to tell your Rembrandts from Bach (intentional), often utter the phrase “well I could’ve done that”, when looking at modern art, but aren’t opposed to a bit of eye titillation from time to time, this is the exhibition for you. On display are works from over 100 artists from 32 countries – even little old New Zealand. There is art (both modern and traditional), design, architecture, animation, performance, video, drawing, new technologies, literally something for everyone. There are exhibits that will make you think; like that of Olaf Breuning’s various pieces which offer comment on modern life. Installations you can contribute to; like Yayoi Kusama’s ‘Flower Obsession’, where everyone that enters adds to the piece by placing a sticker of a flower somewhere of their choosing. Pieces that will leave you in awe; like teamLAB’s ‘Moving Creates Vortices and Vortices’, a fully immersive exhibit where your movements are tracked by sensors and the projections made around you are altered accordingly - so very, very cool. And pieces (and I think these were some of my favourites) made out of everyday items; like that of Dutch art collective ‘We Make Carpets’, who’ve made some incredible art out of everyday items such as pegs and sponges. There is even a piece entirely devoted to your sense of smell. Unfortunately, my nose was blocked when I visited, so I have no idea if Sissel Tolaas’ ‘SmellScape Melbourne_ PastPresentFuture’ was a winner or not. If you go, and have two functioning nostrils when you do, please let me know what you thought. ‘Triennial’ is on at Melbourne’s NGV until April 15th. For more details check out the NGV's website. ps click here to join my mailing list and never miss a blog post.